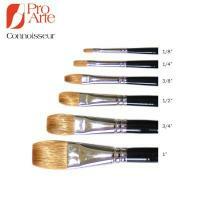 Connoisseur is an artists’ watercolour brush formed from carefully calculated blend of Prolene and sable. The mix is critical and took time to perfect but the result is remarkable. Here is a brush that satisfies the purist! It feels and looks like sable. 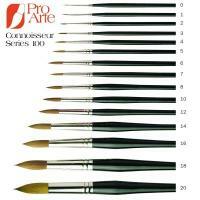 It bellies, holds colour and points in the manner which one has come to expect from a Pro Arte brush. But, it also delights the thrifty with long lasting synthetic content, which helps to keep the price way below a Kolinsky sable. Designed and formulated for use as a watercolour brush, it performs well in every way and has been a great favourite with artists for many years. Seamless nickel ferrules. Black polished handles with red and white tips.